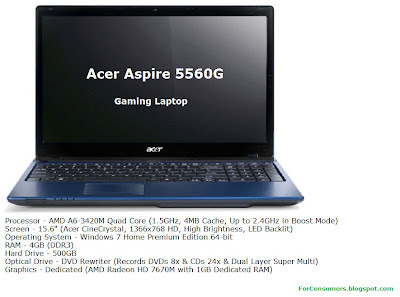 Acer Aspire 5560G laptop review - this very capable gaming laptop has all the technology for amazing gaming experience on the go. Acer Aspire 5560G is a powerful 15.6-inch laptop powered by a fast 1.5 GHz AMD A6-3420 Quad Core processor (2.4 GHz in Boost mode) and the amazing AMD Radeon HD 7670M graphics. AMD App Acceleration lets you do more, faster. Enthusiasts will enjoy amazing GPGPU performance and support for OpenCL™ and DirectCompute APIs. It also supports new features in many top media, entertainment and everyday productivity applications to help improve overall user experiences. The AMD A6-3420 Quad Core processor built-into the Acer Aspire 5560G allows you to handle simple day to day activities such as sending and receiving emails or browsing the web. But they can also help you handle more intense applications such as HD video editing or extreme gaming. Which ever one you choose, AMD processors give you the freedom to do it all from virtually anywhere. The Acer Aspire 5560G notebook features an incredibly powerful AMD Radeon HD 7670M Graphics card equipped with 1GB superfast dedicated memory. With the power of the AMD 7670M, you can be assured that you'll be able to play games with incredible levels of detail without the constant slow-down or 'jittering' associated with lesser graphics cards. From StarCraft 2 to FIFA 12, they'll all run on the Acer Aspire 5560G graphics card, and with eye-popping detail to boot. Whats more, the AMD Radeon HD 7670M graphics card fully supports the latest Microsoft DirectX 11, which supports the most demanding games when set at high resolutions, at high settings, and also includes the AMD HD Media Accelerator. This feature helps to optimize and dramatically improve video playback on PC's by taking advantage of the hardware video acceleration built into the AMD Radeon HD 7670M. Acer Aspire 5560G price - around £400 (in UK).